Audiences were all the rage for advertisers and marketers in 2017. No longer just a tool for social media or display network marketing, audience targets became a major focus in paid search as well. From Customer Match to Similar Audiences, In-Market and Custom Intent, the focus for SEM has already begun to shift away from the “what” of your product or service to the “who” of your prospective clients and consumers. Amid the flurry of audience targeting options being released and expanded nearly every month last year, one unique type of audience targeting in AdWords slipped in under the radar: YouTube Viewer Audiences for Search. This new targeting enables YouTube remarketing audiences for RLSA to retarget video viewers in search. In this post, we’ll dig into this audience type in hopes of revealing why every paid search specialist ought to be taking advantage where possible. “To be successful and grow your business and revenues, you must match the way you market your products with the way your prospects learn about and shop for your products” (emphasis added). As digital marketers, we tend to be very excited about the first part, and very ambitious about the second. Unfortunately, it’s not enough just to connect to the users who are already shopping for our product or service. The goal is to be smart and cohesive in accomplishing the task of marketing both in the “learn about” and “shop for” stages. So let’s first spend a moment on why YouTube advertising and/or content promotion is worthwhile in its own right. 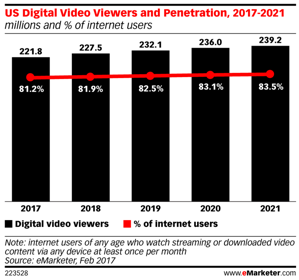 According to eMarketer in 2017, monthly digital video viewership in the U.S. averaged more than 221 million individuals (81.2% of U.S. internet users). Internationally, Western Europe contributed another 219 million viewers of digital video monthly (68.2% of Western European internet users). Think about YouTube, Facebook, Instagram, Twitter, Snapchat, Vine...you name it. It’s not hard to believe that so many of us are voluntarily consuming digital video at least once a month. On the other hand, eMarketer’s projections for the next 3-5 years also show that viewership growth in the near future will be consistent but marginal. Essentially, we are seeing that the market for digital video is nearing saturation in terms of consumption. Of course, this means that the market for video advertising is only going to grow more competitive as we all begin to compete for the same placements: to get in front of these valuable, attentive eyes and ears. It’s time to turn the tables, think outside the box, and stay ahead of the game.We shouldn’t just value digital video as an ad format for retargeting website visitors or driving new website traffic for subsequent remarketing and direct ROI. We don’t even need to argue for YouTube’s potential to “lift Branded search traffic” anymore. Video can now be used to directly populate viewer audiences for targeting on both Search and Display. This is where we connect how people learn about and shop for our products or service. If vast digital video consumption is doing the “teaching,” then our Search remarketing must be ready to capture subsequent “shopping” moments for those users. Before a YouTube Viewer Audience strategy can successfully be executed, we first need to have some kind of presence on YouTube to generate views. This requires some kind of content strategy, video content production, and of course, some level of financial investment and buy-in from company decision-makers (which may or may not fall into your job description). To help out those who need to justify an investment in YouTube advertising, we’ve compiled a group of statistics relating to the reach, device use, geographic locations, demographics, and user behavior associated with YouTube advertising. Beyond the stats, though, the real need for video advertising comes from the reality that we no longer live in a world of easily defined, two-dimensional sales funnels. Buyer journeys are now a web of touchpoints from multiple devices and media, each as unique as the associated prospect. Skilled marketers must be prepared to address and nurture each of these users, at all times and on all platforms. Data suggest that users consult YouTube for help with products and services before, during and after the decision-making process. 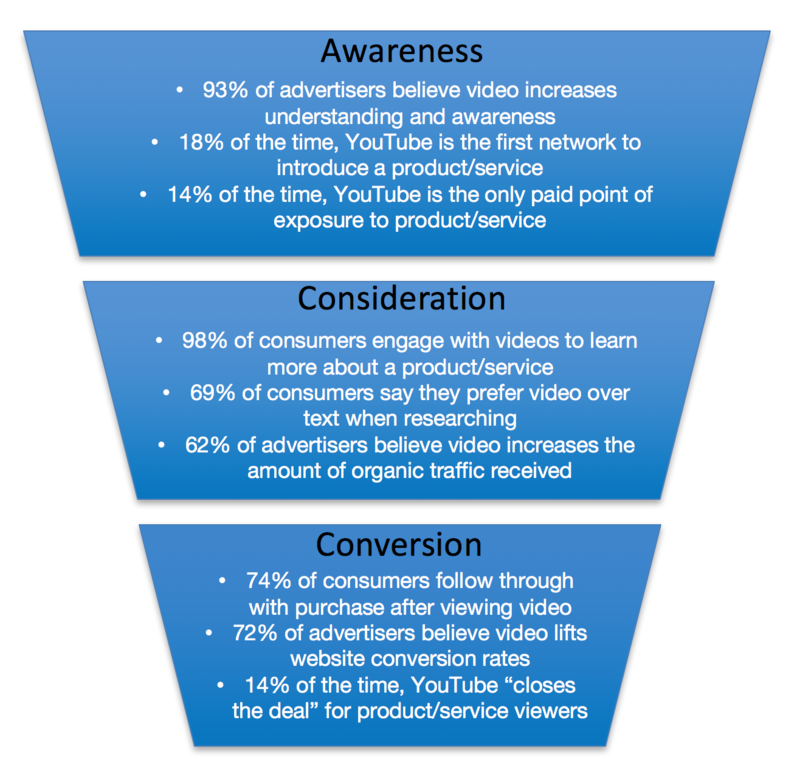 Thus, YouTube can be an active player in all stages of the conversion funnel or buyer journey. So, to stay competitive and create the best buyer experience for every customer, a video content strategy is truly necessary. Without it, all that potential revenue and engagement is wasted. Not to mention missing the opportunity to capitalize on YouTube Viewer Audiences. If the above stats aren’t enough to convince your company heads, you can always ask them to consider a new perspective for YouTube advertising: a low-risk channel for feedback that cooperatively assists more traditional video marketing efforts. 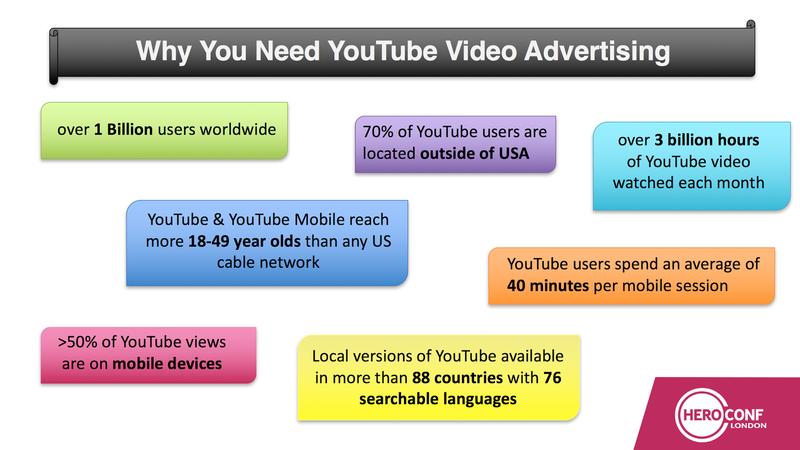 You can also utilize earned actions KPIs and YouTube Viewer audience behavior to show that YouTube ads are successful. These are users who have viewed at least one video from your channel (you can decide which videos to include/exclude based on your channel content). This means they have some familiarity with your brand. They have not, however, visited your website or completed any kind of conversion action. Thus, visiting your website is a clear next step to take in their customer journey. These are slightly lower-funnel than “Website Strangers,” because they have engaged more directly with your brand. These are users who have visited your website once or more, or who have engaged more deeply with your content than simply viewing a video or ad. It may be that they liked or commented on your video, or even visited your channel page. Because these users have an even greater familiarity with your brand, they can be directly targeted with a low-risk conversion invitation. That may mean signing up for an email newsletter or promo code, creating an account for later conversion, downloading a whitepaper, submitting a request for more information, or something else specific to your industry. Lastly, it’s important to address individuals who engage more deeply with your content, whether by subscribing to your video channel or becoming a brand ambassador by sharing your content with others. They have already engaged with your website but just haven’t taken the step to convert. These are users ideal to target with Discount or Promotional conversion offers. You might take advantage of Countdown ads in Search to increase urgency, apply a percent-off discount to your headline, or highlight some other offer to help close that deal. Looking at these three foundational audiences, you can see that each is quite easy to compose. There is a lot of power in data collection and targeting capabilities for not a lot of effort on your part. A few sub-audiences built into a combination audience and you can quickly set yourself up for success. Once your audiences are created, you can start applying them to your established Search campaigns for observation (or “bid only,” if you refuse to switch over to the new Adwords UI). This allows you to see how your Viewers are engaging with your current keywords and ad copy. Utilizing AdWords ad customizers, you can also implement audience-specific messaging with IF-functions in your ad copy. As you monitor and quantify your audience behavior, you can then make informed decisions about bid modifiers or campaign structure to best address these YouTube viewers and nurture them in their decision-making process. In addition to Search campaign application, do not forget the potential to utilize YouTube Viewer Audiences with Display campaigns. You might run a YouTube Viewer retargeting campaign for your Acquainted Visitors or Non-Converting Fans. The Display network can also be a channel for inviting Website Strangers to your landing page. By breaking down your audiences to consider YouTube engagement as well as website behavior, you have the power to show much more tailored creative to these subsets of your prospect list. And of course, once you have your audience lists established and your retargeting strategies in place, be sure to stop back here and share your thoughts. We’d love to hear about your experience in the comments below.